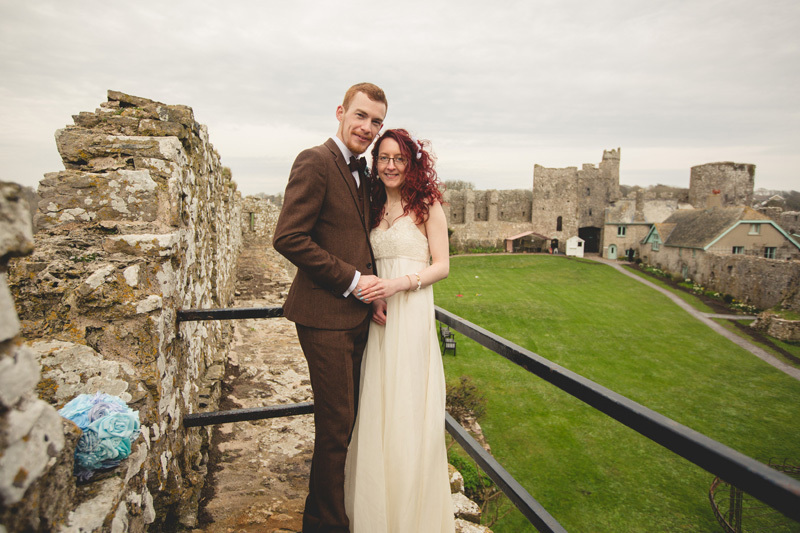 Michelle and Ant had rather a brisk spring day for their intimate wedding at Manorbier Castle. These two are great fun to be with, there’s not too much they take seriously. And with Ant such a stylish dresser (and Guinness world record holder – guess what for) and Michelle a DIY genius who made all the bouquets and buttonholes herself from fabric, it was always going to be a pretty as well as fun wedding. As a surprise for Michelle, Ant refurbished her lovely old bicycle, in the wedding colour! He left it for her to see as she walked in to the castle. Here are some of the fabulous buttonholes Michelle made – aren’t they gorgeous?! I want one!! She didn’t do these only for the groom and his ushers, but for every single guest!!! Look out for them in the pictures below. While the guests had a bit of a munch and mingle and explored the castle, Michelle and Ant had time for some photos up on the battlements and down on the beach. Before leading their guests up the road to Castlemead Hotel, where we left them to enjoy a peaceful dinner. All the photos from the day can be seen on the Clients page of our Wedding Photography web site.